. : Farm Forest Line - Observation and exploration:. A group of professional foresters inspecting a young blackwood plantation began debating whether the trees would contain any heartwood. No one in the group knew of any research into heartwood formation and colour in young blackwood trees. The farmer picked up his chainsaw and opened a young pruned tree cutting lengthways to expose the radial face and old pruning wounds. 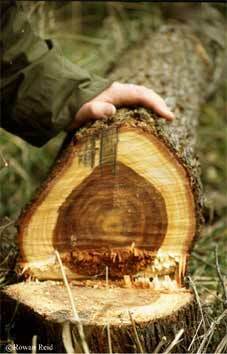 Deep-brown heartwood occupied the first few years growth and the pruning wounds had healed well, allowing clearwood to form. This simple observation extended the knowledge of all those present. There is always something to learn from observation and exploration. Digging a soil pit can help in determining the need for deep ripping or provide an explanation for poor growth. Examining pasture species or crop development beside a shelterbelt can indicate the extent of the tree roots. Simple bores can show fluctuations in the height of saline watertables and the impact of trees on recharge. Going out in the paddock during a heavy storm can provide insight into how a gully erodes. Noting the location of stock camps and observing animal behaviour during hot or cold weather can help farmers design effective shelterbelt systems. Searching out references and talking with other farmers or professionals can help farmers interpret observations and draw practical conclusions based on sound scientific principles.